Set the foundation for your adventures with this set. 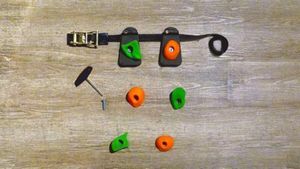 Big holds with a comfortable big grip make this set ideal for kids, beginners and experiential education. Also suited for overhanging routes. Climbing height ca. 2 meters. Tip: With the starting Set Perfect additional you can climb 6.8m.